These past few days have been a total blur! Between summer camps, book clubs and trying to get our super secret project done, I honestly have forgotten the days lol. But none the less, I am still pushing forward! So here is how Day 32-33 went! I only worked out Sunday, because Monday I totally over slept and it was our first day of Apple Camp! But thankfully, I was able to gt in my 3 miles Sunday morning. Plus, not to toot my own horn but..... 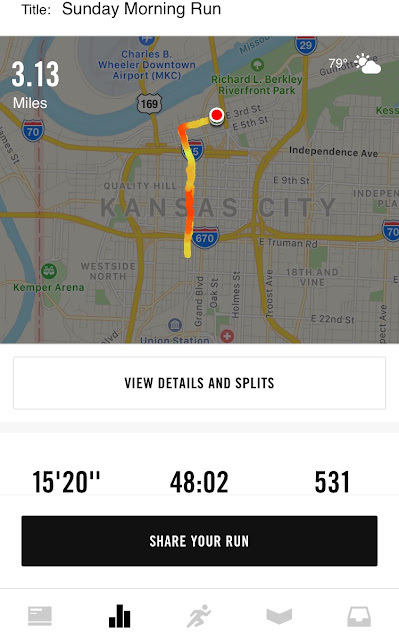 I got a new personal best run for my 5K! I was exhausted when I got home. But when I seen that notification, I gained my second wind! My diet has been pretty wack these last two days. I'm not eating crap, except I did allow myself one piece of cake at the shower on Saturday (it had been a whole month). But mostly I am eating the right things, I'm just going over my calorie limit. One thing I have always been puzzled by was calories. Some trainers say it doesn't matter when you are eating mostly fruits, veggies and lean meats. Then some say it does matter. You ever feel conflicted by this? I know I do! Either way I know I can get back on point! I just have to do it! How was your weekend? What goals have you set for yourself this week? Let me know in the comments below! This is so inspirational. I'm just starting my weight loss journey.